Here's a nice photo of a 2008 45 foot Franklin 5th wheel. We photographed this one in the Gold Canyon RV Park in Apache Junction Arizona. This one is for sale. A nice gentleman and his cute little dachshund named Doc stopped to tell us that several folks had looked at it, and reported that it was super nice on the inside. Two bedrooms, two baths, four slide-outs and very spacious inside. Some of the Franklin RVs are so large they definitely feel like a home on wheels. We're guessing this one weighs in at 16,000 pounds. If you own a Franklin RV we'd love to hear more about them and how you like it. 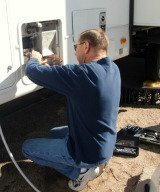 In regard to pricing a Franklin or other RV there are challenges. I did find a website by doing a lot of searching where I could put in the options etc and it priced the ranchwagon model but not the imperial. Generally I believe the ranchwagon is not a fiberglass exterior where the imperial the exterior is fiberglass. The Franklins are awesome at not having a lot of eye candy that hold pollen which is especially troublesome to people with allergies. The large windows in my a Franklin are outstanding to make the interior seem larger. Back to pricing, via the website our 2004 Franklin Imperial 33 ft with two slides 5th wheel priced out slightly over $17K. Having said that only if the market will bear the price at the time the RV is placed on the market. If you are on the market during RV season the market is better for selling than off peak when people are not thinking about RVing. If there is a major hurricane good quality full time living RV's with a washer and dryer will generally sell quicker. If you have one for sale be open to a price adjustment to meet market demands. Good luck selling, buying, or trading. We bought a 40 foot long, triple axle 2003 Franklin Ranch Wagon. Does anyone have any print manual that I can look at or information on the slides? We have 3 - 1 on each side in the back and 1 on the left (driver) side on the top. We are trying to upgrade the insides. F150 pull a 34 foot tt? I did my first drive with my F150 and my travel trailer. I definitely needed 2 sway bars and even with that, the trailer trucks were pulling me on the highway - I had to take my foot off the gas to keep from swaying into their lane. I guess a bigger truck like the F250 would have been a better choice, but still, my F150 did it! Here is a puzzle I would hope someone would solve for me. I have a 1995 anniversary issue Franklin that is 8ft. 6in. wide and is a park model or travel trailer. It is beautiful with a front kitchen, garden tube, roof air, ducted heat, etc. It is obviously the interior upgrade. The awning practically reaches the entire front. I can't find what to charge for this model anywhere. I am considering selling as it only weighs 5000 pounds, a lite weight!! It's in great condition as I pampered it. I have had my old girl for 20 years and everything still works. Well built little camper. Wish there were more of them out there. It is nice to see a good following for the Franklin 5th wheel. This spring (2015) we will probably be putting our Franklin for sale to a good owner. It has a washer & dryer, the rv fridge has been replaced with a 110V double door because we never rv'd off grid. This is a great RV, floor in living & dining carpet & vinyl upgraded with a hardwood type floor. Any suggestions on locating an estimated selling price will be appreciated. Please send e-mail ajeep2012 ..at.. yahoo.com. The 40' Franklin weighs 9,400 pounds (4,264kg). You guys are wrong about your weight. Just because your axles are rated for 13,000 doesn't mean that's what the camper weighs. For the ants use jergens hand lotion or some other strong odour hand cream. The ants have difficulty following trails and usually will not cross the lotion line. Re-do one time a month, very cheap and safe for everyone, and more effective than pesticide. UV light destroys pesticide and that is why it will not work. Ian. I'm a full-timer in this travel trailer. I really like it and hope to renovate and put some soundproofing on the walls to help insulate and make it quieter inside. The only thing I don't like about this RV is that when the cold wind blows outside, it is very breezy inside. I need to find a way to insulate the one slideout in the living room, and I'd like to find a way to keep the ants from coming inside. Sprinking pesticide around the outside of the RV does NOT keep the ant out! Found some info on Franklin Coach Co. I tried finding out what happened to this company because I especially like their designs which consist of open space, light colors, and lots of windows. I bought a 1995 Franklin 32' fifth wheel two years ago. I simply love it. My slideout works fine, but experts agree that one should know how to manually crank the slideout in due to battery/motor failure. Internet sites tell me to look near the bottom of the slideout in the center. I don't see anything in that location. I see a crank hole located next to the landing gear near the left front, but I'm assuming that is for the landing gear. Can anybody answer this puzzle? P.S. I'm a novice, so don't laugh. We just bought recently to leave at a camping facility. We are in love with it. We were told that the company is out of business. If they are slide outs you should have little trouble finding a switch, usually a rocker switch located nearby. Tips outs may be a manual operation requiring some carpenter work etc. 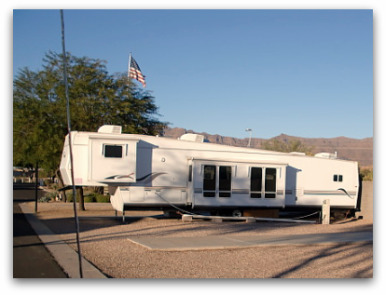 I have a 1996 franklin limited RV-park model-I have 2 slide outs or tip outs. Don't know which one. I've checked for a motor or switch to bring them in, with no luck. Please let me know if anyone can tell me how to get them in. I am at a camp ground and they are putting in new sewers and the slide outs have to go in. It's been at the same camp grounds all these years and I never put them in. I own a 2003 45ft Franklin Ranchwagon 3 axle, 4 slide-outs, 1 bath, 2 bedrooms, washer/dryer, dishwasher, but with all it has the Manufacturers list weight is 10,995 lbs. Surprisingly light for such a big unit, The great thing is the units are very very nice. The truck of choice for these is diesel duallies but they pull very easy. The site appears to be new and only has basic contact information at this time. Does anyone know who manufactures Franklin RV's and/or do they have a website. I have searched the internet for a couple of years and have never found any solid info on them. You may be right about the weight. The wheels were partially covered, so it was hard to tell if the trailer had two or three axles. We thought it had three 7000 pound axles which would mean the trailer couldn't weigh more than 21,000 pounds loaded. If it had two axles it couldn't be over 14,000 lbs. Looking at the wheels again though it must have three axles or that tail swing of the trailer would be really long also. We looked for used Heritage Model Franklin RVs for sale online and those we found were claiming a weight of around 13,800. We figured that may be the dry weight and a slightly shorter length. California has a overall 65' rule that is for the combination of truck and trailer. For this 45' Franklin a tow vehicle like our Dodge Quad Cab Dully 3500 that is 21' long would work, when the fifth wheel is connected the overall length would be less than 65' long. We thought maneuvering a trailer this long could be challenging for some, and finding RV parks with spots long enough to accommodate it could also be a problem. 13,600 on a 31' trailer seems heavy unless it's a toy hauler...what kind of trailer do you have? Our 38' fifth wheel is 12,600 loaded and wet. You may have problems towing this length in some states. I think Calif. has a 40' limit. I would figure it to be more than 16,000 lbs. Our 31' is 13,600.